Can you believe I’m on gratin number seven already?! I don’t really buy the whole lucky numbers thing, but this tomato and mushroom polenta pie “gratin” is most certainly some kind of charm. 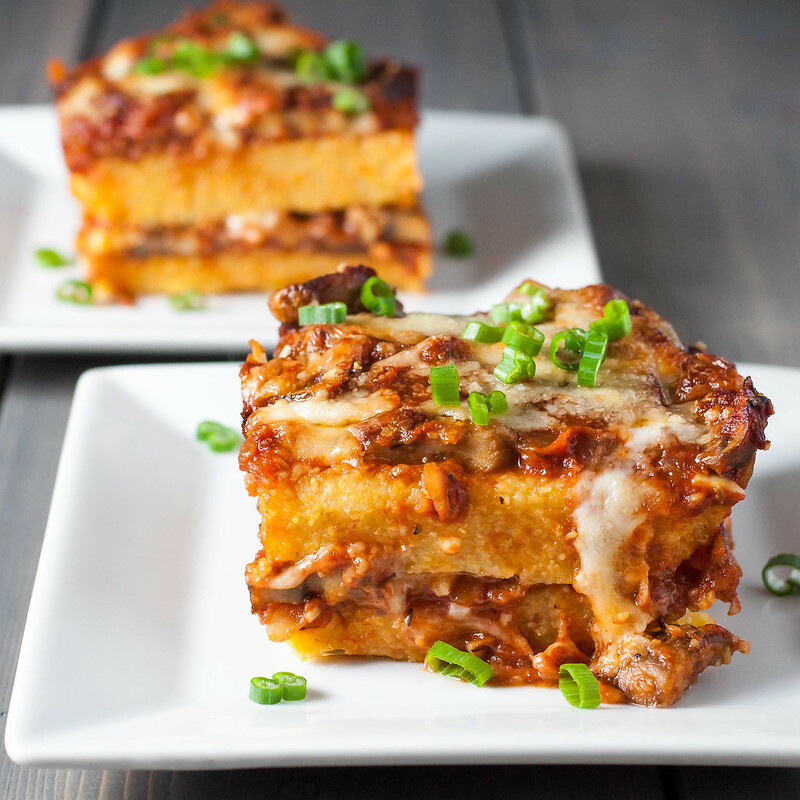 When I first read the recipe, I thought it would turn out with a little bit of a Mexican twist, given the Monterey jack cheese and its similar construction to tamale pie, but really it’s Italian through-and-through. 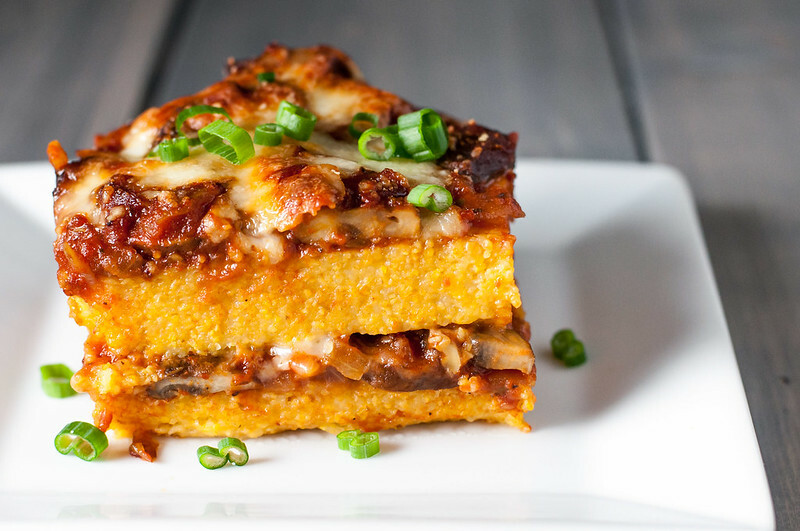 The filling is essentially a quick version of my vegan mushroom marinara, and it’s literally sandwiched between two tender layers of slow cooked polenta. I always, by the way, assumed polenta needed some cream or parmesan to be truly palatable, but this time, for once, I took the time to cook it low and slow in some simple, rich vegetable stock, renouncing all former assumptions upon the first bite. Thanks to the creamy polenta, it tastes like every bite is loaded with cheese, but there’s only a cup of the really good melty stuff in the whole pie. Divided amongst six servings, I dare say we can call this the first healthy gratin. In her book, Madison often provides alternatives to vegan-ize each gratin, but as we saw last week, the substitutions often aren’t ideal and produce unexpected textures. This is the first of the gratins whose vegan option I totally support, and it couldn’t be easier: leave out the cheese. Done. And I didn’t even mention, it’s “naturally” gluten free. I’ve been running about a million miles an hour generally in life lately. I could say it was the post-stomach bug energy burst, but let’s be serious, this is my pace of choice. And no, wedding planning has not even begun yet. I’m so happy to be doing what I love every single day, and I always try to remind myself, when I get “stressed”, that I chose this! Why would I complain about something I chose, right? So silly. 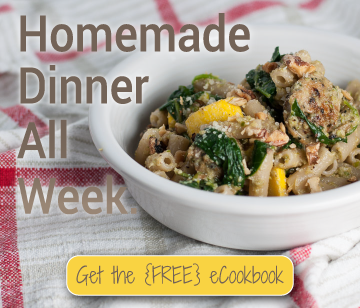 I love to cook and blog for most of my waking hours, but what I don’t love is the tension of Steve coming home from work ready to relax and me still trying to accomplish three more projects that night. No one’s holding a gun to my head making me finish editing these gratin pictures, so why don’t I just call it a night and go lounge on the couch with him? Very fortunately for me, he understands that I have big aspirations up my sleeve for my cooking and blogging, and that I do have this drive to keep going, even when the majority of the world, on their office hours schedules, is settling into the couch for whatever shows are popular these days (hi, I live in Food Network world and have no idea or interest in what’s on other TV). We still need our quality time, though! That’s why we’re shaking up our date night routine of a couple years, which is increasingly difficult to keep meaningful with our current crazy travel and work schedules. Now we’re taking turns planning dates as we feel so moved–not necessarily like clockwork, every week at 7:30 PM. Because most often, 7:30 PM on Friday night is quite possibly our most tired hour of the week. The dates can be as simple as the one I planned just over a week ago: walking to a movie, then crossing the street afterwards for a couple glasses of wine and some snacks, before coming home for dinner. To get my focus on our quality time, not the hour of cooking polenta for this dish when we got home, I made the polenta beforehand, focusing my energy on one thing at a time of day when you’d usually find me putzing between social media and household tasks. Steve banked a nap on the couch while the polenta cooked, so at least we were physically near each other, and I could creepily watch him sleep. After the first ten minutes of constant stirring, I had time to get all the other ingredients completely prepped while occasionally popping over to the stove to stir. When we got home, I didn’t have to worry about my tipsy polenta-making skills. No, I just cooked up the filling, built the dish on the already shaped polenta that had been chilling in the fridge, and let it cook and bubble away while we kept the wine rolling. You can even go so far as to cook the filling and assemble the “pie” ahead of time, up to 24 hours. I tested this method as well, and it worked like a charm. Most likely, those of you with kids running around could have easily explained this lesson in focus and multi-tasking to me, but there’s nothing quite like figuring things out when life necessitates change. No matter what brand of crazy you have going on in your life, shake it up this week, rethink your routines, and see if you can’t still manage to find time for this yummiest gratin yet. Taking time to cook the polenta until it's creamy and tender is well worth it. You're rewarded with a simple, flavorful "crust" for rich mushroom and tomato sauce filling. In a medium saucepan, bring 6 cups water or stock to a boil. Add 2 teaspoons salt, then whisk in dry polenta. Reduce heat to a slow simmer, and stir almost constantly for 10 minutes. Cook another 45 minutes, stirring every 5 to 10 minutes to prevent polenta from sticking to the pan surfaces. If polenta becomes extremely sticky and stiff, add a little more boiling water (I kept some hot in a tea kettle). Lightly oil (with about ½ tablespoon) a 9 by 11 inch (or thereabouts; I used two pans adding up to approximately that size), 2 inch deep baking dish or pan. Line a quarter size sheet pan (or larger) with parchment. When polenta is done, scoop half onto the sheet pan and half into the baking dish. It should be pliable but stiff, holding its shape as you scoop it into the pans. 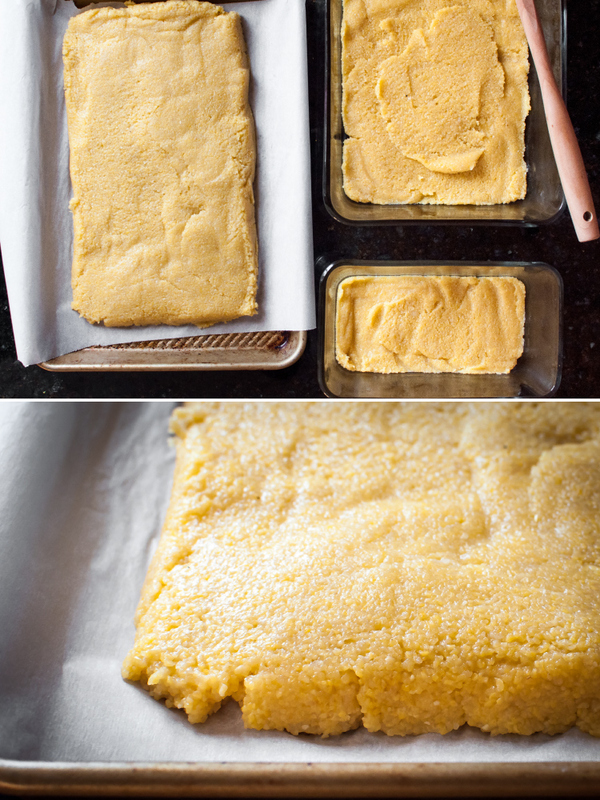 Dampen a rubber spatula and use it to press polenta into an even layer. Press the sheet pan batch into the shape of the baking dish. While polenta cooks, prepare other ingredients and "pie" filling. Heat 2½ tablespoons of oil in a medium skillet. Add onion, bay leaf, and dried herbs and cook over medium heat until onion is browned at the edges, 10 to 12 minutes. Raise heat to medium high and add mushrooms, garlic, and ½ teaspoon salt. Cook until mushrooms are almost tender and starting to brown, 5 minutes or so. Add wine and simmer until completely reduced, then add tomatoes. Simmer about 5 minutes, until thickened, then season to taste with pepper and more salt. Spread half of the mushroom filling evenly over polenta in the baking dish. 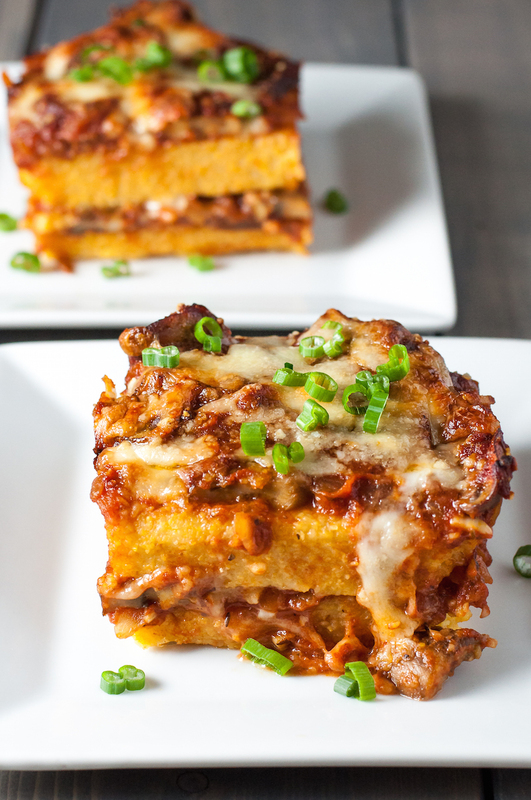 Top with half the Monterey jack and parmesan cheeses, then gently lift the polenta from the sheet pan and place it over the filling (if it doesn't fit perfectly, the dish will still turn out!). Cover with the rest of the mushroom filling and cheeses. Bake until bubbly and cheese is golden brown on top, about 25 minutes. To make the dish vegetarian, confirm that the cheeses don't contain animal rennet. The dish is also gluten free. To make a tasty vegan pie, omit the cheese. Making the polenta is the most time-consuming part of the recipe, but it can be prepared and shaped ahead of time. Cover it with plastic wrap, refrigerating it in the baking pan and sheet pan you used to form it. Note: This page contains affiliate links. It does NOT contain sponsored content. Affiliate links (to products I recommend, on Amazon) offset my ingredient and website maintenance costs, so I can keep bringing you layered recipes like this one. Thanks! Wow this is so genius! This looks like the best kind of comfort food for cold days. I will definitely try a vegan version of this! Let me know how it turns out. Always looking for feedback on the special diet modifications, but I really think it will be just as tasty sans cheese. This look SO good! I’m always looking for recipes that I can make ahead. I work weekends and it’s great knowing I have something easy, and healthy for my husband and son to pop in the oven. I’ll definitely be trying this recipe out! Hope you love it! As I mentioned about a million times already, so worth the time that goes into the polenta. Holy cow – this looks absolutely delicious! 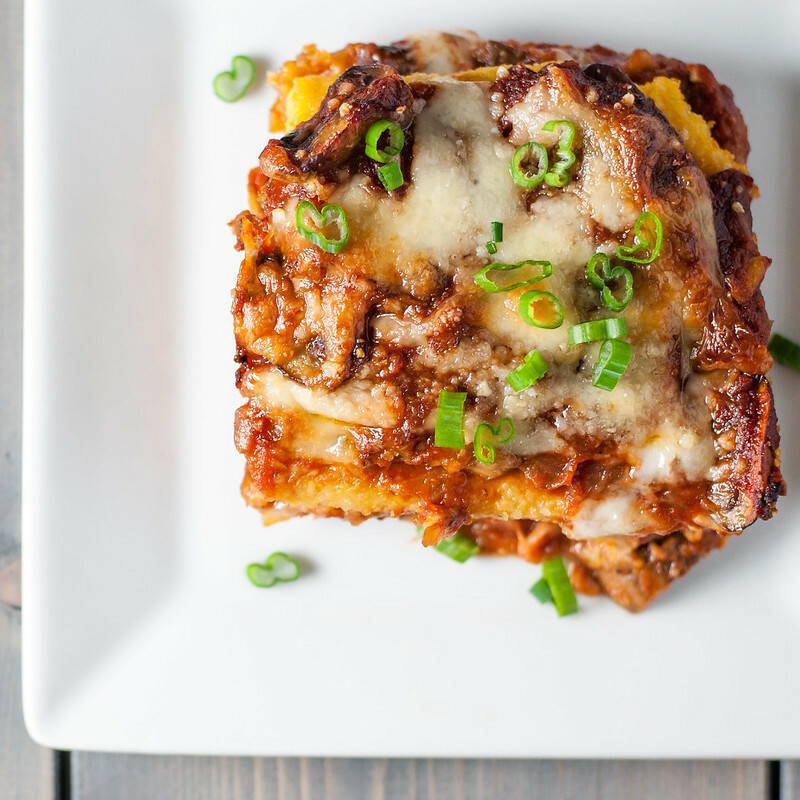 I love your new date night routine idea – sometimes it’s easy to forget to spend time together and instead end up on the couch editing gratin photos for hours;) I can’t WAIT to try this! hey no mention how long to cook the polenta in the oven…..? Leila, sorry the wording is a bit confusing. The polenta cooks once on the stove. “While the polenta cooks” indicates to move on with the recipe while you wait the 45 minutes for the stovetop cooking. Hope that helps!